I had just concluded my stretching class. It was phenomenal. The last was the neck stretches. Kissing the ear to the shoulder. I felt, for a fleeting second that I may have stretched a bit sharp. Anyway, I moved from that session to the next. My trainer, Kev said he’d teach me something new today. I was excited to learn. He said it required power, posture, skill and strength. I asked him, “will I be able to do it?” He smiled, “Of course! 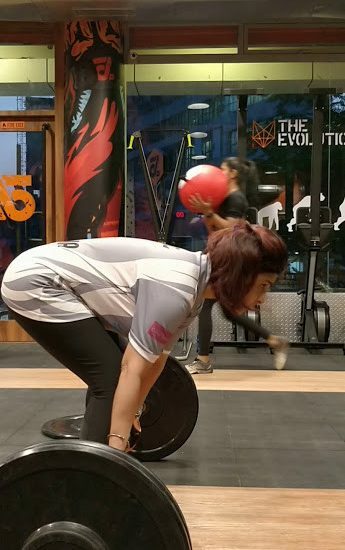 Suri, you’ll take to it like a fish out of water.” I got into my usual warm-up routine – mobility and squats with a few hundred metres of rowing and biking and I was ready. I got into a deadlift position – a half-squat. Pulled the bar through my body to the top with a full shrug and jump – all in one motion. I then got under the weight of the bar with my elbows parallel into a front squat. It was tough getting the motions right and sync it to the fluidity in the lift and jump. Finally, after a few tries, I got it. He added a few weights to the bar and I got started. And. I. Loved. It. I HAD JUST LEARNED THE CLEAN WEIGHTLIFTING TECHNIQUE. I got home and went about my business. Next morning, I had a stiff neck. The pain was unbearable. I visited the sports physio who confirmed that the pain was due to a pull of the muscle during my stretch routine. I was relieved IT WASN’T DUE TO THE WEIGHTS. I was given some neck exercises and the usual cold pack to apply and a muscle relaxant. I was unable to continue my gym routine due to the pain. A week later, the pain still continues mildly. In the one week of no exercise, I learnt some life lessons. The moment you decide you are unwell, you ARE unwell. It’s easy to get into the comfort and play the victim. I realised I was playing a victim throughout the week. Until I asked myself, “Am I really that weak and in pain to do ANYTHING?” Well, you know the answer. It doesn’t matter whether you’ve been injured unless you’re flat on the back. If the upper torso is hurt you can alternate and work out the lower torso or vice versa. Use lighter weights, gentle movements. Walk, do sit-ups, squat, work the core – DO SOMETHING. The body needs to be working else it may lose its capacity to carry a load. No matter what setback you may achieve in life, the victor keeps moving. Trying to be perfect is a set up for failure. I’m a Type A personality. I wanted to be ready to be back at the gym in the shape that will allow me to do my regular workouts. I couldn’t. I had to do the best I can with what I have. I walked into the gym and began my routine with lesser weights, lower intensity however with a determination that was stronger. It was okay not to be able to complete the set. It was okay to accept I couldn’t go further. The expectation to be perfect or surrounded by perfection is being harsh and unkind to yourself and those around you. So, I’ve accepted and each day I push myself to get towards my goal – when I trip and fail, I don’t beat myself up. It’s okay. Your body is always communicating with you. Keep listening. When you use and abuse it, it responds with a cry and its echo can be heard in the pain you experience. I tried to get competitive by pushing myself too hard so I could be better. Isn’t that what you do in life? Push yourself at the cost of your body. You ignore it thinking you are immortal and unbreakable. Till your body screams when it can’t take it anymore. Listen to it. It’s talking to you, every moment. Every single day. It’s been 4 days since I’m back. I haven’t been doing the cleans yet, however, I’m listening to my body and going with its rhythm. One day at a time. I’ll get there, soon! To jump and smash! Keep up the victor attitude!